Haaretz, Damascus airport hit podrobnosti.ua. "Weapons shipment" to Hamas may be hit, as reported. Syria apparently denied there was a strike. Samir Kuntar (Hezbollah) reported killed in an airstrike on a Damascus suburb. Strike by Israel (as an interested party) is presumed in Russian media, however neither Syria nor Israel confirmed that. Wikipedia: On May 26, 2008, Israeli sources announced that Samir Kuntar was among those who would be exchanged for the bodies of two reservists, Eldad Regev and Ehud Goldwasser, captured by Hezbollah in the Zar'it-Shtula incident that sparked the 2006 Lebanon War. On June 29, 2008 the Israeli ministers cabinet approved the prisoner exchange between Hezbollah and Israel which would involve the release of Kuntar despite intelligence stating that the two soldiers were almost certainly dead. Kuntar and four other prisoners released as part of the deal were the last of the Lebanese prisoners in Israeli custody. Also part of the deal was the release of the remains of other Lebanese from all other previous wars and, after a suitable interval, dozens of Palestinian prisoners. On July 16, 2008, Hezbollah transferred coffins containing the remains of captured Israeli soldiers Ehud Goldwasser and Eldad Regev, in exchange for Kuntar and four Hezbollah members taken prisoner during the 2006. Lebanon War. IDF says Syria fired missiles at its jets, but denies claim aircraft was downed. On Monday evening, Syrian fire crossed into the northern Golan Heights as a nationwide ceasefire brokered by the US and Russia came into effect in the embattled country. In response, the Israeli air force attacked cannons belonging to the Syrian regime on the Syrian side of the Golan Heights. 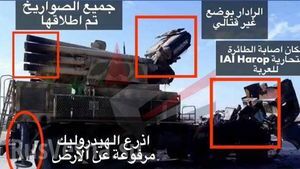 Video claims to be the moment when Israeli jet was hit by S200 air defense missile (denied). It is also claimed that a drone was downed, with some downed drone photos on social media. JPost The alleged Israeli attack hit a scientific research center where chemical weapons are manufactured, according to the Syrian Observatory for Human Rights. According to the reports, the attack was launched at 2:30 a.m. on targets located in central Syria, in the area of Hama, and also targeted several weapons convoys that were en route to Hezbollah strongholds in the area. The Syrian army charged later on Thursday morning that Israel killed two of its soldiers during the aerial attack. S-200 battery near Damascus was damaged by Israeli strike. The Syrian Army has warned of “dangerous consequences” following an air strike by Israel on a regime SA-5 antiaircraft battery east of Damascus, after it fired a surface-to-air missile at Israeli jets. Syria’s SANA state news agency reported that the Assad regime “warned of the dangerous repercussions of Israel’s repeated aggression attempts, stressing Syria’s determination to continue its war against the terrorist groups, Israel’s arm in the region.” According to SANA, the Syrian air defense “directly hit one of the jets, forcing the enemy to retreat,” contradicting Israeli military claims that all planes had returned safely from the operation. The SA-5 missile battery, which was stationed some 50 kilometers east of the Syrian capital, fired at the Israeli jets which were on a routine aerial reconnaissance flight in Lebanese airspace, IDF spokesman Brig.-Gen. Ronen Manelis stated. Israel believes that the Syrians fired at the Israeli jets at 10 a.m. Monday after thinking that they intended to attack. All Israeli aircraft returned safely to base and a few hours later responded by launching four missiles toward the same battery, destroying it. IDF Spokesman Brig.Gen. Ronen Manelis told journalists that Russia was updated about the incident, in which no Israeli jets were harmed, in real time, and that it will be brought up during the visit of the Russian Defense Minister Sergei Shoigu who is set to land in Israel in the coming hours. Syrian contributor to Rusvesna notes that the event occurred on the Syrian air force professional holiday (describing that as provocative and using emotional language throughout). It is notes in the post that no military personnel on the ground was harmed. JPost: Israeli aircraft attacked an Iranian base outside Damascus according to Sky News. According to foreign media reports, the Israeli fire was carried out from Lebanese airspace. The reports said that in response anti aircraft missiles were fired on the plane. 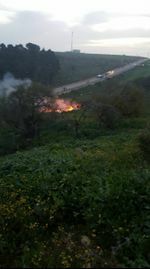 Israeli F16 'crashed' in Northern Israel, amid intensive Syrian anti-aircraft fire, with implication the F16 had been downed by it Sputnik reports. According to IDF spokesman report Israel had been targeting an Iranian drone control centre, and the downed F16 was involved, after an Iranian drone entered Israel from the Golan Heights. Extended report by RT including details of response in Northern Israel where alarms were sounded and aerial explosions heard. RT reports an Iranian drone was shot down by an Israeli helicopter. In response Israeli F16s attacked 'Iranian targets' in Syria, the drone control centre/drone’s launch site at the Tiyas Military Airbase near Palmyra in a 'complicated surgical strike'. There have been earlier reports that Russia is flying small number of SU-25 planes from Tiyas airbase (also Russian commercial interests in the nearby area have been reported). Haaretz: F16 PilotS were forced to eject. Israel operates a twin seat F-16D variant in addition to the normal single seat variants. Reports suggest that the plane was F16I "Soufa", which Israel has in a 2-seated option. The pilots are safe and were transferred to a hospital. One of the pilots is reported in 'serious' condition. Videos of drone and command vehicle destruction have been posted by IDF. An Israeli spokeswoman declined to comment on the attack. news outlets close to dictator Bashar Assad’s regime reported that Israel was in fact behind the attack. US officials said the US had not launched airstrikes on Syria. Israel said it does not comment on foreign news reports. “According to a military source in Damascus, the Syrian Air Defense system was deployed from the Mezzeh Air Base after the jets entered Syria from Lebanon’s Beqa’a Valley,” Lebanese news site Al-Masdar News reported. 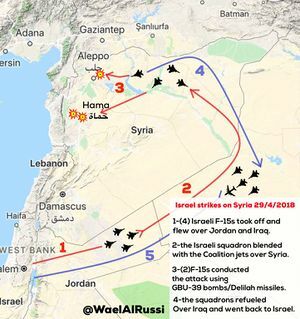 That is the route that Israeli jets generally take before bombing military targets in Syria, according to foreign reports. On April 9, between 03:25 and 03:53 Moscow time, two F-15 aircraft of the Israeli Air Force, without entering Syrian airspace, struck the T-4 airfield with eight guided missiles from the territory of Lebanon. Air Defense units of the Syrian Armed Forces destroyed five guided missiles during an anti-aircraft battle, three missiles reached the western part of the airfield. There are no casualties among the Russian advisers in Syria. The first photos to emerge from a Syrian air base targeted by an air strike early Monday morning were published Wednesday by the Iranian Tasnim news agency. Israeli attacks on Iranian military positions was reported, 29 Apr. 2018, however it was not confirmed. According to early reports, "strikes targeted the outskirts of the village of Jabal, located about 5 km from the city of Hama, Syria. "The Israeli Air Force attacked Iranian positions, but partially touched the position of the 47th division of the SAA and warehouses." IDF aircraft did not enter Syrian airspace.". Israeli sources appear to blame warehouse explosion or a ground attack. However, there is a range of opinions by commenters without direct knowledge, some not excluding Israeli role, and (not unusually) no official comment (yet). Fiery hell: "RusVesna" visited the site of a night air strike on a secret base in Syria (PHOTO, VIDEO), 30 Apr. 2018. There were explosions at the ammo storage, attributed here to an Israeli attack. Noted. Those April, 29 events occurred shortly prior to Netanyahu major announcement claiming Iranian violations of the nuclear deal (video) , 30 April, 2018. IDF: Iranian forces fired approximately 20 rockets, some of them were intercepted, no injuries were reported. Netanyahu is in Moscow for the V-day celebrations. As part of broader strikes exchanges, Israeli missile struck Syrian Pantsir S1 vehicle at Mezze airbase, Damascus province. Rusvesna commentary: (1) Syrians overlooked the attack, a man (identified as lt. Ali Mustafa) is seen running towards Pantsir vehicle shortly before the strike (2) old model of Pantsir has radar only on one side (3) Rusvesna attributes the attack to Spike NLOS missile, a long range anti-tank missile with a range of about 25 km, saying that fragments were found. It's plausible; Wikipedia describes targeting system as infrared (heat seeking), not the most useful here , but other targeting systems in development are mentioned too. Syrian Media: Two Israeli Missiles Strike near Damascus Airport -JPost, 26 June, 2018 (AFP),(TASS,Rusvesna-own sources). The air defenses hit one of the "attacking planes and forced the rest to leave" Syria's air space according to Syrian state media citing a military source. Syrian state media did not report any casualties, but according to Syrian opposition forces there are nine dead on the base. Al Jazeera, citing Arab media sources, said between four to six rockets hit the air base and surrounding areas. An army officer in the southern Syrian desert said the air defense system shot down missiles coming from south of the Tanf region towards the Homs air base. Syrian state television said Israeli air strike had hit a military post in the city of Misyaf in Syria's Hama province but caused only material damage. An intelligence source said a major military research center for chemical arms production was located near the city. Some of Iran's military bases in Syria are next to Syrian military compounds, according to the intelligence source. The Israeli army has carried out more than 200 air-strikes against Iranian targets in Syria and fired over 800 missiles and mortar shells over the past year and a half, the IDF has revealed. 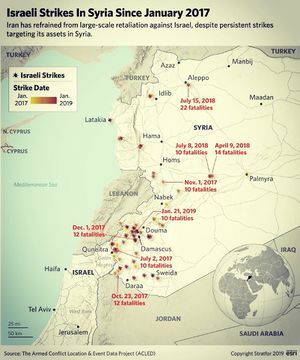 The strikes were meant to prevent Iranian entrenchment in Syria, and led to the Islamic Republic evacuating several bases in Syria, according to the IDF. The campaign also interrupted Iran’s arms smuggling. According to ministry spokesman Igor Konashenkov, Israeli F-16s carried out air strikes on Syrian targets as two civilian flights were landing in Beirut and Damascus, putting the passengers at risk. According to a report by Newsweek quoting a source in the US Defense Department, senior Hezbollah leaders were targeted in the air strikes. Other locations reported by Syrian media to have been struck during the strike include pro-Iranian military positions located in the suburbs of Damascus, air defense facilities and headquarters of the 68th Brigade and the 137th Brigade of the Syrian army in the Damascus area, a military headquarters belonging to the 4th Division of the Syrian army in the Al-Muna area surrounding Damascus, and military Unit 10 in the district of Qatana. Syrian state media said the strikes were carried out from Lebanese airspace and that a number of “hostile targets” were intercepted by its S-200 air defense system. Israel’s air defense system was also activated, with a smoke trail seen from Hadera south of Haifa. Earlier on Tuesday, an Iranian cargo jet belonging to Iran’s Fars Air Qeshm landed in Damascus International Airport. The Boeing 747, affiliated with Iran’s Revolutionary Guard Corps (IRGC), took off from Tehran at 5:30 p.m. and landed shortly after 7:45 p.m. The airline has been repeatedly accused of smuggling Iranian weaponry to Hezbollah, and was suspected to have transported military equipment from Tehran to the Syrian army and Hezbollah.